We are smitten kittens when it comes to The Pronovias Wedding Dress collection. Each season is better than the last and here is their latest wedding dress collection. We’ve picked our fave wedding dresses below. Lots of beautiful ball gowns, sumptous laces & organzas, ruffles & scallops. We see a trend here! Revisited classics, romantic designs and touches of 50s glamour. Imperial line and camisole-style dresses skim the silhouette using lace, double silk organza, French lace and chiffon with guipure. For volume, the skirts and trains are full of scallops and frills. A majestic option not lacking in regal fabrics with a subtle shine, such as Mikado silk, organza or soft satin. The neckline has its own personality with strings of gemstones, flowers or natural feather appliqués. We absolutely adore Opulence, it’s our most popular range by far and magazines can’t get enough of it. It was an easy decision to feature this luxury range as the first of our monthly ‘In the Spotlight’ wedding stationery blog posts. In a series of spotlight posts we’re going to focus on one design each month to give prospective clients a close up & detailed view of the collection, including close up images, information on the design and just what makes the Opulence wedding collection so special. We have sourced the globe for the finest lace and the silkiest satin to use in our luxury wedding range. Naturally, the crystal dobbers used on the design are very heavy (an indication of their quality) you can tell from just holding the invitation that this design really is the business. The crystal brooches are very sparkly and have the ‘wow factor’ which is the first thing that your guests will get from these invitations, followed by how beautiful and incredibly well made they are. This is becoming a regular in the feedback that we receive from our Brides after their big day and often from their guests who feel that they must contact us to let us know that they have received an invitation and want to tell us how gorgeous they are! It takes a lot for someone to do this which shows how irresistable this design is. The crystal brooch forms the central feature in this luxury design. For Brides/Grooms who love the vintage lace style but not wanting something so bling, we have a sister collection called ‘Vintage Lace’ luxury lace wedding invitations (click on the name to view) which features all the key materials for a vintage and lace wedding theme but without the luxury crystal and without the luxury price tag. Vintage Lace invites start from £4.35 (we will spotlight on this collection another time – Vintage Lace image shown below far right image next to the Opulence invitation). 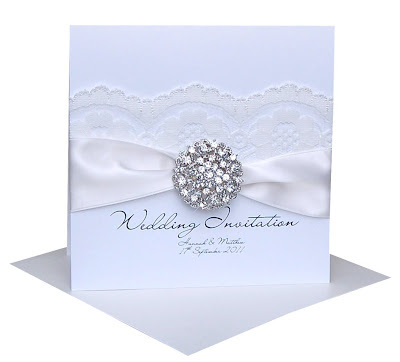 Opulence Invites feature our specially imported vintage lace. The lace has a fine weave and floral design, carefully finished on both edges with a deckle finish. 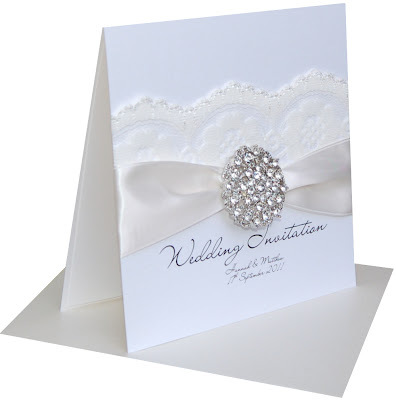 We can design your invitations with either ivory lace, black lace or white lace to reflect your wedding theme. 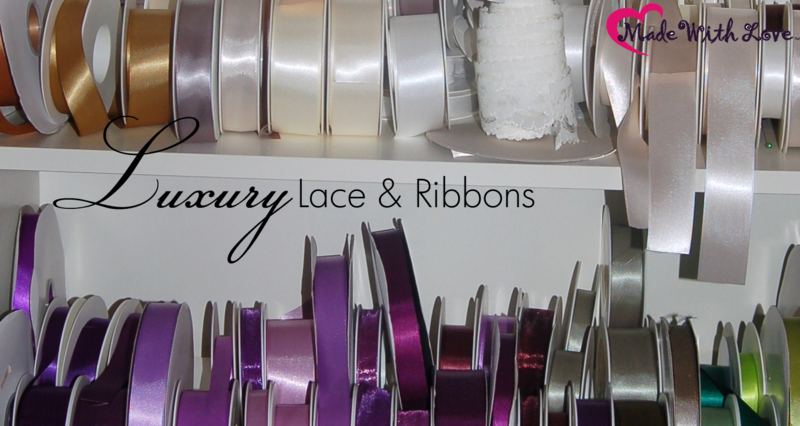 When it comes to the ribbons used on our ribbon luxury invitations, we use the finest double-faced satin ribbon in the world which is spun in 100’s of colours. These ribbons are super silky and we are able to supply reels of ribbon in your matching colours if you want to carry on the theme of your wedding stationery for your venue decoration, flowers etc. Our ribbons are supplied by the world’s leading ribbon manufacturer, who we chose because quite simply their ribbons are the silkiest, most rich in colour and exquisitely made satins that we have found. And we’re in good company, many exclusive fashion boutiques, designer fashion houses including Chanel & D&G also choose these ribbons. The chances are if you have bought something from one of the exclusive shops on Bond Street, London, you will have come across the ribbons in their products and exquisite packing. The Opulence luxury wedding invitations collection is set on thick quality board (300gsm) with a pearl finish, accompanied by matching insert paper available in ivory or white (as well as bespoke colours on request). 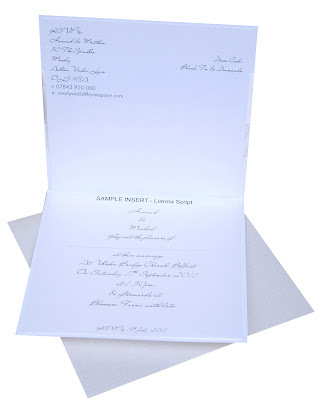 We use special thermal printers with solid wax ink to print your invitations. This has it’s advantages as the finish of the print is superior to laser or inkjet printing. This gives a waterproof finish (helpful for any tears from guests when they open your beautiful invite and any accidents which may occur when it’s on display in your guests home!) as well as a slightly raised print for maximum clarity to give crisp printed text. Invitations are printed with your personal details (which does not cost any extra). We can personalise your invitations with the Bride & Grooms names and wedding date on the front of your invitations and all the necessary details printed inside. If you’re stuck for what to include in your wording we have some invitation wording templates on our website which can help. Invitations can be supplied with matching pearlescent envelopes (slightly larger that the invite to accommodate the 3d nature). If you plan to post your wedding invitations to guests, we strongly recommend that you opt for the boxed invitation. We feel that this design is too beautiful to risk sending in a paper envelope. Though, many clients have sent their invitations out in envelopes and have been very happy to do so. We supply boxes for only 50p each to allow you to not have to compromise on the design. Boxed invites and enveloped invites can be posted as Large Letter Size (Royal Mail). When we receive your paid order, please email your wording to be printed. We will start work on a proof for you to be able to see how your wording will look. Once you are happy and sign off your proofs, your order will go to print & design. We typically need 4-6 weeks for the design of orders although we may be able to reduce these lead times a little bit for urgent orders. Please enquire before placing your order to enquiries@madewithlovedesigns.co.uk . Priority slots are available which will guarantee your order for 14 working days costing £60. Please add this priority service to your shopping basket to ensure the speedy design slot is added to your order. We have many colours available to design the perfect luxury invitation for your special day and recommend that you order a sample invitation in your colours. We will send free ribbon swatches with your sample, which are carefully chosen by our designers to reflect your colour scheme for you to compare (you may find something different in these swatches which you love or the swatches will re-confirm to you that you have made the right choice). Love this design? Order luxury invitations online today from here. In this collection we do: luxury save the date cards; invites; luxury breakfast Menus’; Luxury table plans; Favours; Luxury table names/numbers; Luxury thank you cards; and the full range of luxury stationery for your day. We also have over 40 wedding invitation collections on the Luxury wedding stationery and luxury invitations for weddings which can be personalised to match your perfect day. Oh! to be in Vogue. It’s been a whirlwind week at Made With Love. It’s the first week in our new studio and we’re just about settling in. And and and… Our luxury lace & diamonds Opulence Wedding Invitations have been listed in British Vogue Magazine’s May 2011 issue Royal Wedding Special: ‘Love is in the Heir… Vogue’s guide to a wedding fit for a princess’. Our Union Jack Queen Anne Wedding throne chair and footstool got a mention too. Horray! It’s still amazing for us when we see our work in any magazine. But Oh! 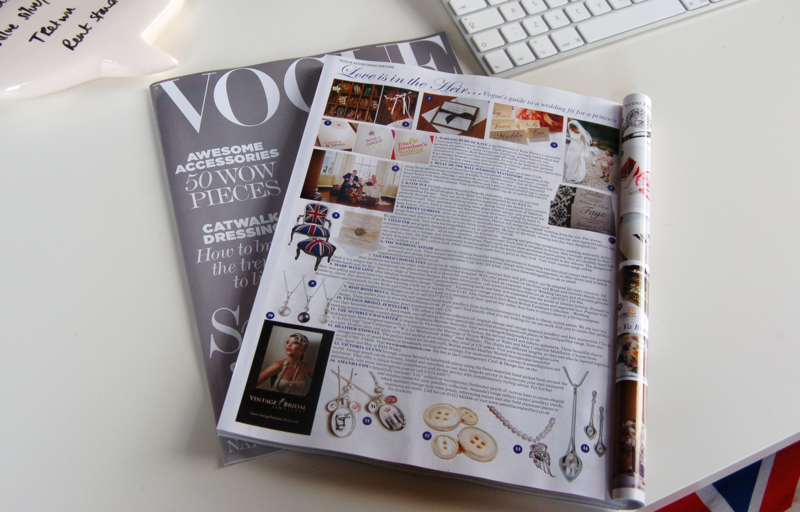 to be in Vogue… this one definitely gave us chufty badges! Marry me ? 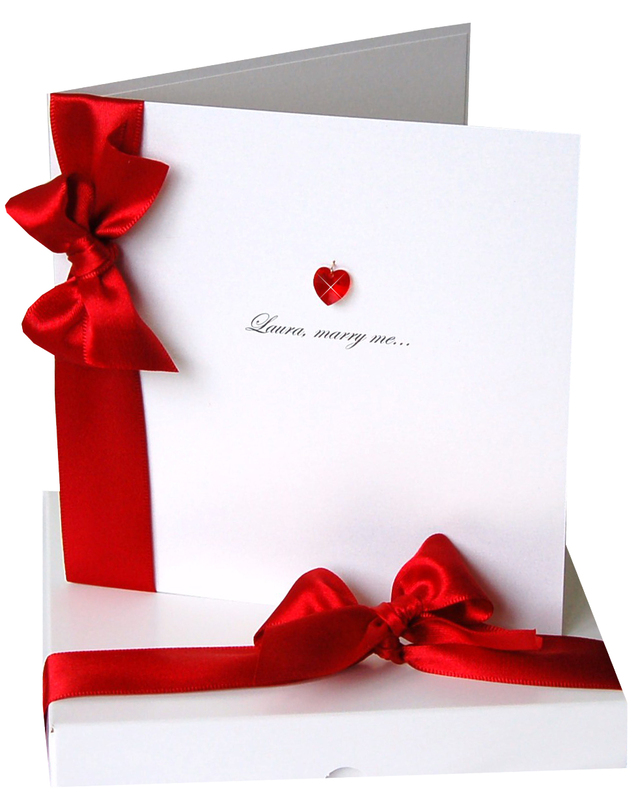 Pop the question in a card. Some lovely news this week here at made with love. We’re used to dealing with wedding stationery and anniversary cards, so imagine our excitement when we received an order through for a personalised bedazzled card with the wording “Marry me” on the front – A marriage proposal in a card! We’re incurable romantics here at made with love and so we had to contact James (who ordered the card) for his story. James met Laura a year ago when he started working in the office where she worked. It was all a bit of a whirlwind and before long they had moved in together and things were going swimmingly. James is planning on taking Laura out for a meal and when they return the room will be decorated with candles and fairy lights, taking centre stage will be a ring and a made with love bedazzled card asking Laura to marry him. The following day James is whisking Laura on holiday for her birthday, could this story get any more romantic…..we hope so. We’ll update you all as soon as we know the outcome. 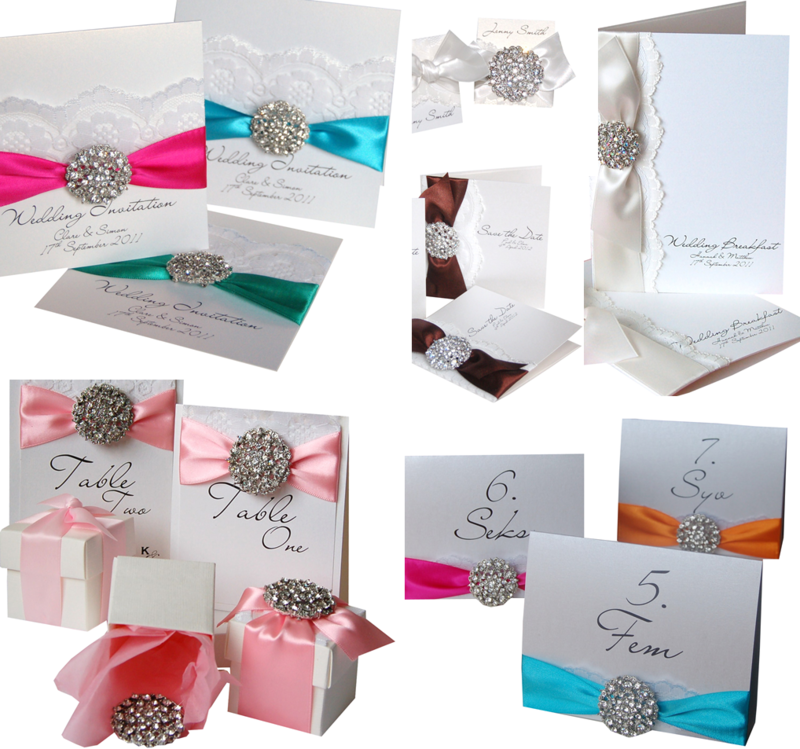 We are extremely excited to introduce the most luxurious wedding stationery collections ever by Made With Love Designs! 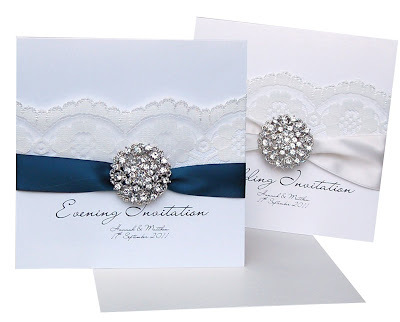 Featuring specially imported lace, vintage brooches, luxury crystals, diamante clusters, sumptuous satins and pearls… our new lace wedding invitations collections really are something else. The first staionery collections to be unveiled this week is The Opulence Collection. A timeless vintage lace wedding stationry collection suitable for vintage inspired weddings, luxury themed weddings and available to personalise to suit your wedding colours. Opulence is truly beautiful and is going to be a huge hit for Brides looking for something a little bit special for their big day.